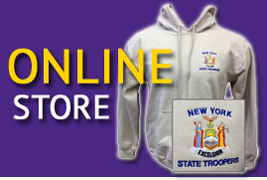 The Police Benevolent Association of the New York State Troopers, Inc. The NYS Troopers PBA Signal 30 Fund was created by the Police Benevolent Association of the New York State Troopers, Inc. 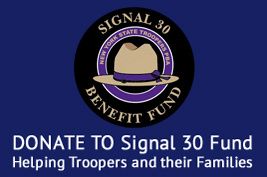 The purpose of the Signal 30 Fund is to support the members of the New York State Police in extraordinary circumstances such as line-of-duty death, illness, injury, and loss of residences to fires or floods. 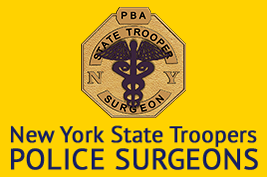 The Police Benevolent Association of the New York State Troopers, which represents active and retired members of the New York State Police, has always had a close relationship with members of the medical community throughout the State of New York. The PBA Surgeons Group offers honorary membership into the Association for Surgeons who share the interests and desires of our vast membership. Routine patrol duties are never 'routine.' Danger can be found in every aspect of a Trooper's job, from a traffic stop along the side of a highway to a manhunt for a serial killer. State Troopers PBA members risk their lives every day while serving and protecting you. Many have made the ultimate sacrifice in pursuit of their duties. Retired PBA member Kevin Kailbourne continues his quest to mark the graves of every deceased New York State Trooper, regardless of the amount of time served. While he has made great progess in this journey, he is looking for your help in completing this project. The PBA is teaming with Kailbourne to help locate the burial sites of our deceased Troopers by asking PBA members and the public to submit information to Kailbourne on the whereabouts of graves. The State Troopers PBA does not solicit individuals or call people at their homes asking for donations. An affiliated organization, the NYST Benefit Fund Inc., contacts businesses and sells advertisements for inclusion in the PBA Trooper magazine, which is published two times a year. This advertising income is for the NYST Benefit Fund, which can be used to pay for several member benefit items, including the funeral expenses of New York State Troopers killed in the line of duty. The State Troopers PBA works hard to serve and protect its members who work hard to serve and protect you. In addition to seeking fair wages and benefits for our members, the union challenges unfair and unproductive working conditions. Since danger is inherent in the duties of Troopers, the PBA makes it a priority to monitor safety conditions and equipment such as patrol cars, portable radios and bulletproof vests and to seek better solutions for our members.